Of the 100 stories inspired by the paintings of Miguel Panadero I wrote, we ended up choosing just 51 for our book Dibugrafias. 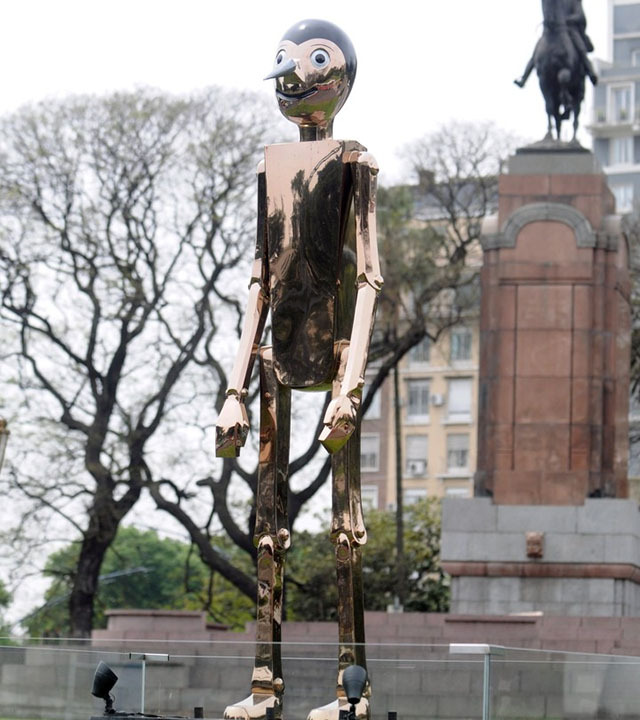 Here’s one we didn’t use, Pinocchio strikes again, which came to mind after reading this article, Una brillante escultura de Pinocho denuncia la corrupción en Recoleta (A brilliant statue of Pinocchio criticizes corruption in Recoleta) in Argentinean daily Clarín, published on November 2. The artist, Alberto Echegaray Guevara, says the aim of the four-meter high statue, weighing 260 kilograms, is to highlight all the corruption and lying in the world. “Corruption is intrinsic to us, and is globalized. It’s the same with lying. Scientists say we lie between two and 200 times a day, it’s called the ‘science of deception’ and covers different types of lies. And when we can’t lie to anybody, sometimes we lie to ourselves. That’s the famous self-deception, one of the worst kinds of lying,” says the artist in an interview with journalist Maximiliano Kronenberg. Alberto Echegaray Guevara’s credentials are nothing if not impressive. As well as being an artist, he’s a specialist in money laundering and crypto-currencies, a graduate of the Ecole Nationale D’administración in Paris, holds a Master in Arts from the University of Georgetown, and a post-graduate in Management from Harvard Business School. And it’s all true. Perhaps we can learn something from all this around these parts, where we see to love inventing qualifications! Here’s what all those Pinocchios deserve, in this humble servant’s version of Miguel Panadero’s Pinocchio, as mentioned above. The girl says it’s great that Pinocchio is the guy with the most, but that Eugenio, her boyfriend, says the same, and that somebody has to be the least. 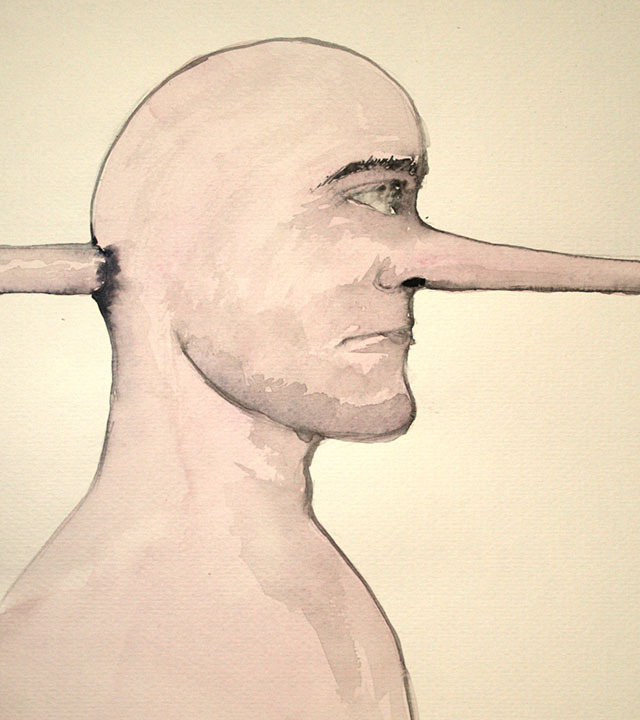 Pinocchio tells the girl that her Eugenio is definitely lying and that what he says just can’t be true. The girl says Eugenio says that it’s Pinocchio who’s lying. Pinocchio is angry because the world is awash with liars. Eugenio is angry for the same reason. The girl is angry with Eugenio as well as with Pinocchio and tells them both to quit striking again, left right and center, lying all over the place, because the whole thing has backfired on them. Now she doesn’t love either of them. Aro Beach, May 31, 2014.